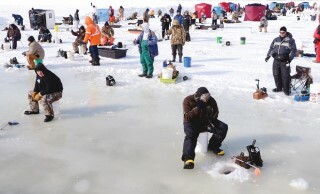 The Sebago Lake Rotary Club is hard at work planning the sixteenth annual Sebago and Cumberland County Ice Fishing Derbies. The dates this year are Saturday, February 25 and Sunday, February 26, 2017. Deb McPhail, past president and current treasurer of the Sebago Lake Rotary Club, is co-organizing the event this year along with Cyndy Bell. McPhail said the organizers have plans to meet with the Town and Warden Service next Tuesday, to get confirmation that all is good to go. As of Wednesday, February 15, it looks like the 26 lakes and ponds in Cumberland County are frozen. "Always ice fish at your own risk," McPhail added. “We’re hoping Sebago Lake will freeze, especially the Raymond Beach area because that’s kind of the hub for us,” McPhail said. On Saturday at noon, the Maine Children’s Cancer Program will be on-site to hold a major fundraiser: The Polar Dip. Every person who registers, gets a chance in the fish pool drawing, which includes a 2017 Polaris Sportsman 450 All-Terrain Vehicle (ATV), purchased from Team Woody’s Performance Center in Topsham. There are more than $12,000 worth of other prizes in the fish pool as well, McPhail said. Every fish weighed also earns an entry into the fish pool drawing. “I don’t care if it’s a little tiny pickerel, it can be weighed in and that puts them in for prizes,” McPhail said. Because the derby serves as an important fisheries management tool for Maine State biologists, this prize pool is put together to encourage everyone to weigh every fish they catch. Anglers can enter up to six fish in each category each day, a total of 24 entries per day and 48 entries over the two-day derby. It is recommended that those who are fishing bring address stickers to make the fish pool entry process move more quickly. Stickers should include the phone number used to register. Big fish prizes are also awarded to the three biggest fish in four categories: Pike, perch, pickerel and togue. Anglers will take home gift cards to Kittery Trading Post in the amounts of $500, $200 and $100 for first, second and third places. There is also an opportunity to win $100,000 if a record breaking togue, which is over 31 pounds, eight ounces is caught. The fishing derbies are the largest fundraising event the Sebago Lake Rotary Club puts on each year, McPhail said. The money goes directly back to the community through donations to the Maine Children’s Cancer Program, Camp Sunshine, and many other charitable organizations. The event requires participation from the entire club. “We only have 26 members in our club, and it’s all hands on deck,” said McPhail. “We also get family and friends to help too,” she added. Three weigh stations will be open from 7 a.m. to 5 p.m. each day. Locations are at: Raymond Beach, Sebago Station at the Standish Boat Ramp, and Jordan’s Store in Sebago. The awards ceremony for the Sebago Lake and Cumberland County Derbies will be held on Sunday at the Windham Indoor Shooting Range, at 6 p.m. Doors open at 5:30 p.m.
Hooked on Fishing, a kid’s derby, will be held on March 4, from 9 a.m. to 1 p.m. Sponsored by the Kittery Trading Post and Inland Fisheries and Wildlife, this event is intended to introduce children to ice fishing. There is no pre-registration and the first 500 children, 12 and under, who arrive before 10 a.m. will receive a free ice fishing rig. The derby is free to participate in, but Range Pond State Park, where the event will be held, has a gate admission of $1.50 per person between the ages of 13 and 64. To register for the derby online, or for more information, visit: www.icefishingderby.com.